· So let’s figure out which techniques have the highest result-to-time ratio, denoted here as JPH (job offers per hour of work) – just like MPH on your car’s speedometer! While it can be tempting to dive right into the sea of online job listings, let’s first see how efficient that technique is. According to Lever’s data, online applicants are hired in 1 out of 152 cases (~.7%). So assuming that the average online app takes about 30 minutes to find and complete, that gives this strategy a JPH of .014 (since you can complete two applications in an hour). In other words, you’re likely to get .014 jobs per hour of work you put into online applications. So, it should take about 71 hours of online applying (or roughly 142 applications), on average, to land one offer. The appeal of online applications is that you feel proactive – with each app, it seems like you’re one step closer to the occupational promised land, however small each step may actually be. But what if you didn’t even have to take a single step? What if jobs could come to you??? That’s the appeal of a LinkedIn profile – the idea that recruiters will search for candidates online and approach you about opportunities. And it’s not an unrealistic premise; Lever data shows that nearly a third of all hires were “sourced” by recruiters using exactly this technique. So assuming that you’re a strong candidate for your desired role (i.e., you have most of the qualifications in the job descriptions you’re looking at), does it make sense to invest in an awesome LinkedIn profile and then put your search on autopilot? To find out, let’s say you put 10 hours of work into your profile – you get a really awesome headshot, you research the best profiles in your industry to make yours as compelling, and you track down lots of compelling recommendations. And then let’s say that in the course of a month, there are 100 openings in your field and location, with 100 candidates each (again drawing on Lever average data). Given that 31% of those candidates will likely be sourced and assuming that a good LinkedIn profile gives you a 1% shot at being sourced, this means 31 opportunities will come your way. Now, Lever data shows that sourced candidates have a 1 in 72 chance of being hired (1.4%). So that gives you an average of .43 job offers to show for your 10 hours of work or a JPH of .043. And, as unpromising as that sounds, recognize that it’s 3x more efficient than just applying online! But if there was an even easier way to put great jobs on your career plate? Enter the headhunter. Again, assuming that you’re fully qualified for your desired role (since headhunters only want to bring in low-risk candidates who will get them paid ASAP! ), this could be a promising path. After all, agency-referred candidates get hired a whopping 1 out of 22 times (4.5%) in Lever’s dataset. So to assess efficiency here, let’s say you spend five hours on a headhunter search: Looking them up online, reaching out, chatting with them on the phone. And then, let’s say that a decent headhunter puts you in the running for five opportunities within a month. Given the strong hiring rate for these kinds of candidates, you can expect an average of .23 job offers for your five hours of work here – or a JPH of .046. Which not only crushes online applications but also even nudges out our reigning efficiency champion, LinkedIn. So if you fall into this sizable bucket, are there any job search shortcuts open to you? Well, there is a huge one: Employee referrals. Not only is this technique huge in output (nearly 20% of all jobs are filled this way, according to Lever) but, even more impressively, it’s huge in probability: 1 in 16 referred candidates get the offer (6.3%); a 10x boost over online applicants. So let’s assume that each referral takes about an hour to source – from searching LinkedIn for connections on the inside (here’s my step-by-step guide to getting in touch with anyone), getting introduced to a 2nd degree connection, and asking for a referral. That means we’re looking at .063 jobs per hour of work here or a JPH of .063 – nearly 5x better than online applications! · Start with any obvious referral opportunites – these fruit are so low-hanging, they’re practically rolling on the ground! And no matter where your search takes you, don’t leave your career in the hands of fate. Especially when data is ready to guide you on a smarter path! 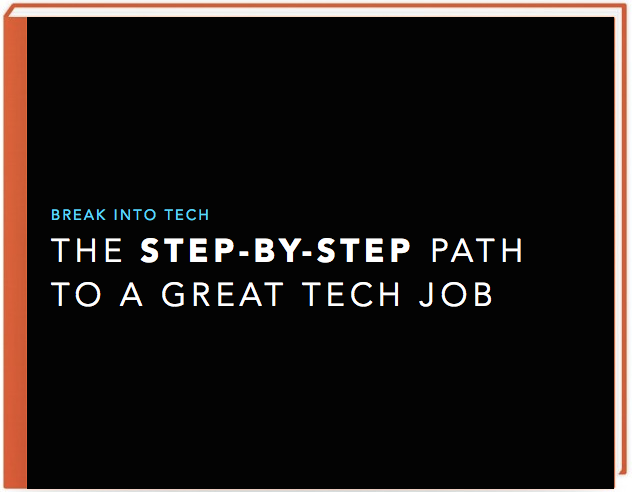 Want more tips for breaking into tech? Get free access to my step-by-step course to landing a tech job, based on my experience going from teaching kindergarten to jobs at Apple, LinkedIn, and startups.